Courtesy of the BBC. All of them. Doctor Who returns tomorrow, to start off the 50th anniversary celebrations. And you can't celebrate 50 years of Who without also celebrating 50 years of Daleks. Featured in the second ever serial, and fifth ever episode of the show, their appearance and subsequent fame, known as Dalekmania, dramatically changed the direction of the show. Originally designed as a children's educational history programme, the addition of the Daleks marked the transition into full on science fiction. Current showrunner Steven Moffat describes them thusly: "They are the most famous of the Doctor's adversaries and the most frequent, which means they are the most reliably defeatable enemies in the universe." Which is true. Not only does the Doctor ward them off at the end of every encounter, the Daleks rarely come out of an encounter having accomplished their intention. Their greatest victory, the ultimate destruction of the Time Lords, happened off screen. Most tellingly, no Dalek has been responsible for a regeneration. Even the TARDIS herself can make a claim on that. So, hit the jump to look back at the best serials, and the worst, featuring everybody's favourite mutants. Perhaps not the best acted, or the episode with the highest productions values, and considering they were expected to be a one-off creature, this adventure makes very little sense compared with the rest of the Dalek stories. But it was the first, and established the Daleks as a single minded adversary, though one less menacing then they would become. This episode is essentially a replacement episode for the Second Doctor serial, Power of the Daleks. 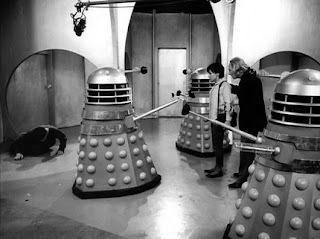 Both episodes feature a limited number of Daleks, pretending to be subservient to humans, while attempting to replenish their ranks. Victory's line, "I am your soldier" is a direct reference to Power's "I am your servant." Power, the first story to feature the Second, is completely lost. Victory is important for two reasons. First, it is the first story since the series' return in which the Daleks are not "completely destroyed, forever and everyone of them", and that, like the title suggests, it is the first Dalek storyline in years in which the Daleks actually succeed in their episode specific mission, namely to rebuild the Dalek race using the progenitor. You won't often find seventh Doctor stories on the 'best' side of Doctor Who lists, but this one deserves a place for two reasons. First, it features the destruction of Skaro, the Dalek homeworld (which the audio series, books and comics have all bent themselves into odd shapes trying to retcon), an event that probably led to the full scale outbreak of the Last Great Time War. But it is the second reason, illustrated in the above image, that marks this episode's place. The Daleks were showing their age, not having had a memorial outing in years. They were no longer the bogeyman of children's dreams. They weren't scary anymore. After all, how scary can something be if it can only attack you so long as accessibility ramps are available. This serial proved, there was no where a Dalek couldn't get at you, if it wanted. While simply levitation has been overdone on the new series, extending even to Daleks being space worthy, this serial made the Daleks terrifying again. If only for a time. Usually, when a show resorts to telling the origin story of a major character, it means they've run out of things for that character to do. And in many ways, by this point in the show's history, they had for the Daleks. During the runs of the first three Doctors, the Daleks were a constant foe, appearing nearly every year. It was only starting here that their appearances became much more rare, which each Doctor encountering them only once (twice for Four, since he stuck around so long). Adding to the quality of the serial is the fact that the Daleks barely feature. They do show up, of course, but it is Davros who is the focus. That, and learning that the Daleks aren't just evil things, but were born of a harsh, pure sort of evil. Fitting really, considering that they started out as a Nazi metaphor. And, unlike other stories featuring this enemy, this one shows the Doctor's greater side. Given the option to prevent the creation of the worst species ever, his morality cannot allow him to commit genocide, even knowing what will happen if he doesn't. Good men have many rules indeed. The episode where Daleks became truly terrifying. The one that, afterwards, sent children running behind the sofa at the sound of their voice. In their first appearance, they were scary, but they never really did anything that would warrant them becoming the Doctor's arch enemy. In their second appearance, they've taken over Earth. Not attacking, as the TARDIS arrives well after that. The Daleks have won, humans are slaves, and civilisation is in ruin. The images, like that above, or of them rising out of the Thames, stuck a cord with contemporary viewers, who still had the war fresh in their minds. 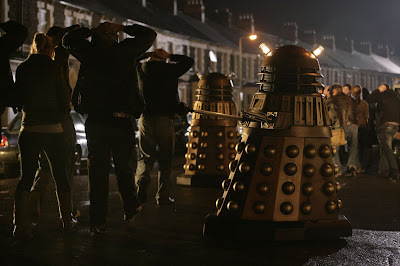 Daleks patrolling the streets of London brought to mind German advances, and what might have been. So powerful an image it proved to be, the show used it again in a later Second Doctor Cyberman story, The Invasion. This story is actually pretty strong. Parallel universes, using time travel as a plot device rather then just as a way to get to the story, and a successfully menacing return by the Daleks after years of absence from the program. It ends up on this list because, due to their absence, and the show now being in colour, the production only had three Daleks to work with. Which was fine, for the most part, when it was only one Dalek in a control room, or a pair patrolling a corridor. But when there were meant to be legions of them, and it was painfully obvious that they were just filming the same three over and over, took all the steam out of them. Suddenly, they looked like an activist who organises a protest, and only a couple hippies, a lost college student and her mum show up. Just... pathetic. And that's not how Daleks should look. Look at the description I wrote about Genesis. Now, apply the opposite of all that to Resurrection. 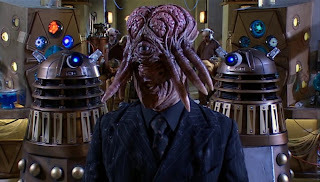 Davros had, after his two Baker appearances, become the focus of any Daleks stories, despite never having a good reason for him being anywhere outside of his initial appearance. Gone is the Doctor's moral conscious, as the above picture shows, as he seriously considers straight up murdering Davros. This story is a mess of ideas, bridging a modern day London story with a futuristic spaceship plot, and the cloning of the Doctor by the Daleks to assassinate the Time Lords, which introduced a rivaly that comes from thin air. 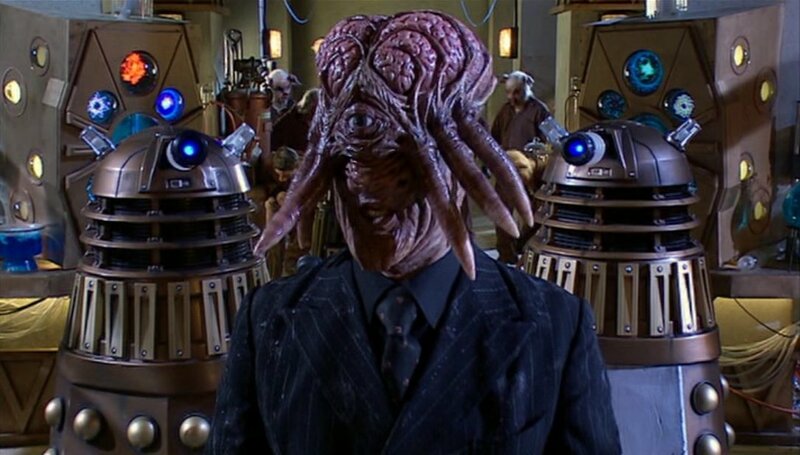 The idea of Dalek-made duplicates infiltrating various societies, by the way, was never referenced again. A perfect example of the problems of the Russel T. Davies era of Who. This finale was bloated, overly dramatic, tried to pack in everything it could, including bringing back every single companion (a real vice of Davies), and fell back on putting the entirety of the universe in danger (something Steven Moffat can't seem to shake either), only for the day to be saved, and the Daleks destroyed once and for all, again. Everything had to be grand and definite, which always turned out to be temporarily definite.This was essentially two hours of gimmicks, including Wilf shooting at a Dalek with a paintball gun, two Doctors, and a fake regeneration. Only the return of Davros gave the episode any kind of weight, which is impressive considering that Davros had been useless in his previous four appearances. As of this episode, the Daleks had been the series finale Big Bad in three of the four series since the show returned. At this point, the Davies era Daleks were nothing more then empty shirts in tin suits. It is actually easy to explain how an entire race can keep getting wiped out, and return. Entire races are big, ghastly things, and one of two are always libel to spill through (unless you do something stupid like specifically mention that the race ending thing will find every example of the race in the entire universe, and destroy them, only to have to go back on that). It is much more difficult to explain how a single person keeps avoiding death, especially when we've seen the death ourselves. Such was a problem with the Master, and such is the problem with Davros. The writers clearly thought they had locked onto another Master level character here, but had no idea how to actually use him. This story is so far removed from sense and reason, it hurts. 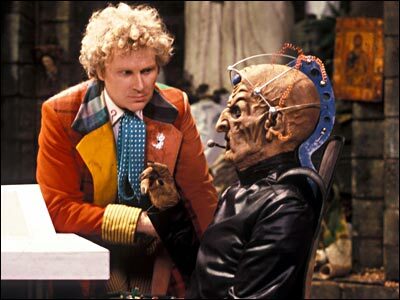 The Doctor and Peri do nothing the entire first episode, which seems like a very long set up to the cliffhanger. There are subplots involving unlikable, and entirely new characters, that supersede the Doctor. The rest of the story, Davros making new Daleks out of the corpses of humans, makes little sense, but that wouldn't stop Russel T. Davies from borrowing it for Bad Wolf years later (Davies could always be counted on to take inspiration from the very worst ideas). After this, the series took an extended break, and it's not hard to see why. There have been a lot of bad Who over the years. And while Ghostlight will probably be remembered as the worst ever, Manhattan will surely place second. Owing it's plot to a Second Doctor story line, Evil of the Daleks (the first time the Daleks were destroyed, completely, and forever), in which Daleks attempted to splice human DNA into themselves, in order to be superior. Ignore the fact that the Daleks began life as a Nazi metaphor, and that the characters themselves seek not only racial purity, but seek to destroy all life in the Universe that isn't Dalek, this double episode was ridiculous from start to back. Daleks using the Empire State building to turn humans into pigs (Davies had a real thing for pigmen), incredibly cliched mobsters, and the sort of understanding of the Depression in America that you only get from not doing any research. Look at that picture. Not just one, but many several people looked at that, and said, "yes, this needs to be on TV."